Several research studies have shown that keeping baby close to Mom at night helps everyone get more rest and results in longer breastfeeding duration. British researcher Dr. Helen Ball found that breastfeeding mothers with their babies in bed usually sleep facing the baby, with one arm above the baby’s head. In this position it is almost impossible to roll over on the baby (at least without dislocating your shoulder!). There are other factors to take into consideration, too. 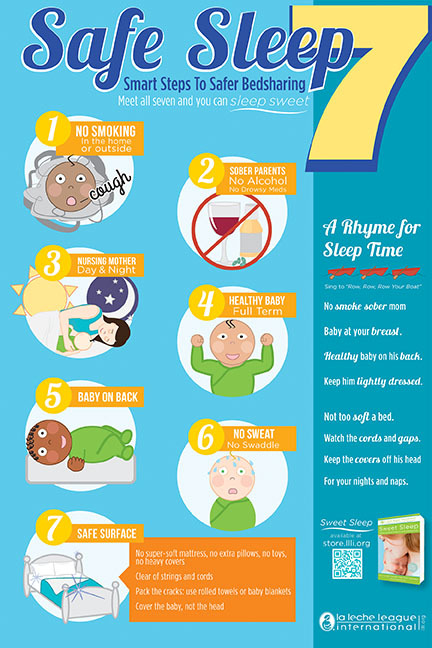 Parents who smoke, or who are under the influence of medication, alcohol or drugs that might make them sleep too heavily, should not share a bed with their baby. Baby needs to sleep next to Mom, not between Mom and Dad or an older child. Waterbeds are considered to be more dangerous, and you need to be sure the baby can’t fall off the bed and become trapped between the bed and the wall, for example. When mothers feel they have to get up to feed their babies at night, they also run the risk of falling asleep on the couch or chair while nursing – which is obviously more dangerous. La Leche League Canada continues to encourage mothers to be aware of the ways they can make co-sleeping safer. If you can meet the Safe Sleep Seven criteria and the Safe Surface Checklist then solid research indicates that your baby’s SIDS risk is no greater in your bed than in a crib. And your automatic behaviors and responsiveness as a breastfeeding mother make it practically impossible for you to roll over on him. By about four months, research indicates that bedsharing with a healthy baby by a responsible adult on a safe surface is as safe as any other sleep arrangement. 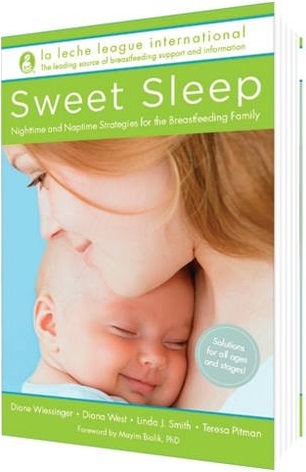 The Safe Sleep Seven and The Safe Surface Checklist are from Sweet Sleep: Nighttime and Naptime Strategies for the Breastfeeding Family Copyright © 2014 by La Leche League International, Diane Wiessinger , Diana West, Linda J. Smith, Teresa Pitman. 512 pages, available via http://www.lllc.ca/ Chapters Indigo link. If you have found this article helpful, La Leche League Canada would appreciate your support in the form of a donation at http://www.lllc.ca/ so we can continue to help others breastfeed. Thank you!